It's okay if you block me. But if you had a moment, I just wanted to ask why? I'm working hard to build my Pinterest presence but I'm still new to all this. So if I did something that is considered “non-Pinterest etiquette” please let me know so that I don't repeat the mistake. I didn't really care if I could follow this random person, but I was definitely curious why she would block me. She wrote me back a sort of weird e-mail. I do not know why you were blocked on Pinterest, I did not remember blocking you, but I had a problem with people re-printing my content and photos and stealing my copyright protected content a few months ago, so am careful about who I follow and who I allowed to follow me. I used to have an social media assistant and perhaps she blocked you. To be honest, it appears that much of your content is centered around selling of products, specifically for adventure travelers, and I do not pin a lot of that type of content, as my readers are Gen X women with children, more interested in family travel than drones and adventure travel. It also appears that most of your content is selling of travel product, and I do not pin many ads, as my readers/followers would have a problem with that. I also notice that you do not legally disclose that you are selling content by adding the FCC required #ad hashtag on your Pinterest pins. Sites that do not legally disclose are looked upon less favorably because they are not following US law, and tend to be “spam” sites, so many bloggers keep their distance. I have been blogging a long time and have worked hard to develop my Pinterest boards with content that offers real travel tips and ideas for my followers, not ads. Your blog content seems very nice and I do not think you are a spam site, it is just not a good fit for the content I curate. You could tell at one point in that e-mail that she had re-written a section but forgot to erase the previous version. It really doesn't matter. I didn't care to explain to her that I'm not new to blogging, I'm just new to Pinterest. I've been blogging since before most people even knew what a blog was and I've been involved in affiliate marketing since 2003. None of that matters, except that I had to prove her wrong about what she told me about affiliate disclosure. I did some research on Google and found no definitive answer to my question. So then I took it to some Internet marketing Facebook groups to see if the members had any insight. I posted the same question in about 3 groups. I'd show you the answers I received but none of them were too worthwhile. One person in the Internet Marketing Super Friends group said, “True”. My friend Mike said, “You are correct.” And someone from Spencer Haw's Niche Pursuits group said, “She was lying..” While another member spouted something in broken English that I couldn't quite understand. He said, “You need to disclose on Fb that you have an account on Pinterest that have links to a blog post on a standalone blog that are affiliate.” Whatever that means. I think the reason I did not get many answers to this question, and that the few answers I got lacked in confidence, is that no-one really knows. The FTC laws about affiliate disclosure are super vague. On my website I have an Affiliate Disclosure page where I go into detail about how affiliate marketing works and how I benefit from clicks and purchases. On top of every post I have a short affiliate disclosure with a link to my detailed affiliate disclosure. The above should satisfy the FTC's requirements in that I'm explaining my relationship with companies and the potential benefit I have to a visitor clicking on my links in layman's terms. And I'm not hiding this disclosure on some tucked away section of my TOS or About page. The link itself that I shared on Pinterest or social media was an affiliate link. Meaning, I wasn't directing people to a blog post that contained a disclosure statement, but was instead directing people immediately to a 3rd party site via an affiliate link. The entire post was sponsored or was a paid advertisement for a product. In those two scenarios, I would have to disclose within the Pinterest description or social post that this was an advertisement. But as long as I'm writing informational posts that provide value to my readers — posts that aren't ads and weren't sponsored by anyone — I don't have to “double disclose”. There start to become too many degrees of separation, and beyond two-degrees of separation is where I personally draw the line on disclosure. What does this lady expect from me? To include a disclosure in my e-mail signature because my signature includes a link to my website that contains affiliate links? Am I supposed to write on my business cards, “My site contains affiliate links”? But in hindsight, the advice about putting #ad in my Pinterest descriptions came from a woman who thinks that being “careful about who I follow and who I allowed to follow me” will prevent people from stealing her images. She does realize that I can still view her profile and her images whether or not I can follow her, right? Maybe not. I should've taken what she wrote with a grain of salt, but my curiosity got the best of me. I want to play by the rules so I took some time to re-research affiliate disclosure again and see what info was out there in 2017. In conclusion, like everyone else, I have no idea what I'm doing with affiliate disclosure. The FTC laws are a bit vague. So my rule of thumb will be, “Do you personally feel comfortable with your disclosure if you were a visitor to your own site? Are you doing everything you can within reason to be transparent about your business practices? Does your disclosure do its best to adhere to FTC regulations that you read?” And if I can answer yes to all of those questions, which I currently can, then that's the best I can do. And if an issue with the FTC ever arises, I'll honorably defend myself, make any changes required to improve my disclosure practices, and deal with any potential consequences when the time comes, which hopefully will be none as I'm acting in good faith which is all I think the FTC wants. 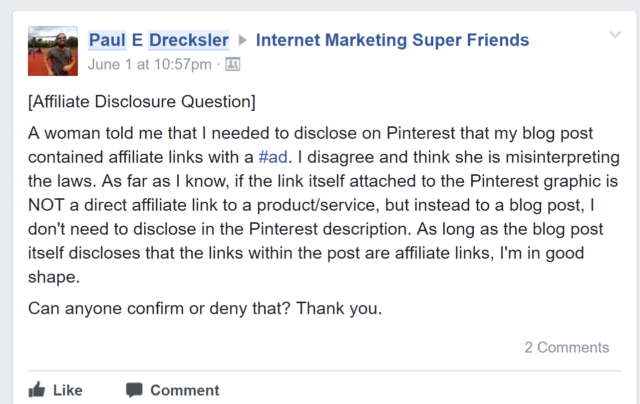 “You need to disclose on Fb that you have an account on Pinterest that have links to a blog post on a standalone blog that are affiliate.” That’s the funniest thing I’ve read all week! Thank goodness that isn’t the affiliate disclosure rule.